Offering plenty of space to families and larger groups who want to enjoy a relaxing holiday in Mauritius by the beach, this villa places you right on one of the most picturesque beaches on the island. With panoramic views of the sparkling ocean, the villa is found in the fisherman village of Trou d’Eau Douce, which provides the ideal setting for a nice stroll while inhaling the salty sea air. 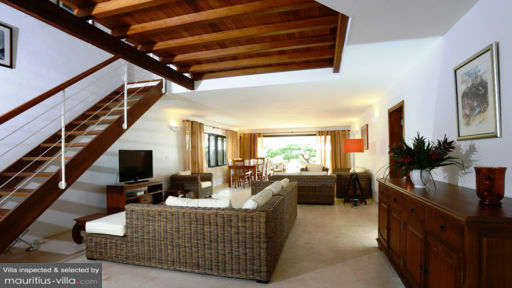 More importantly, Villa Belle Vue 3 does boasts ample room to very comfortably accommodate your friends and families. As a guest of the villa, you can also enjoy plenty of services and amenities designed to render your stay even more comfortable. Villa Belle Vue 3 offers three beautifully-appointed bedrooms to comfortably accommodate visitors. On the ground floor, you’ll find the master bedroom which also provides a private access to the saltwater swimming pool and terrace. This particular bedroom even comes with an en-suite bathroom, mini bar, safe, dressing and a double bed. The guest bedrooms are located on the first floor. The first guest bedroom also boasts a mini bar and an en-suite bathroom, along with a double bed and a panoramic view of the beach and ocean. As for the second guest bedroom, it has four single beds, ideal for the kids. Villa Belle Vue 3 is nestled in a large tropical garden which opens up onto the sea, providing you with spectacular views of the Indian Ocean. While the garden boasts plenty of shade, you’ll also be able to make full use of the sun loungers which are ideal for relaxing as you soak in plenty of the tropical sun. Ideal for working on your tan, the emerald-green garden even boasts a salt water swimming pool, ideal for a restful bath after a long day of exploring the island. Extremely spacious, airy and designed to let in plenty of sun, the living areas of Villa Belle Vue 3 are designed to feel just like home, but with some added luxury. There’s a living room with wicker furniture, a mantlepiece, coffee table and even a flat screen television with satellite French and English channels. A dining table has also been set up for your convenience, but if you want to make the most out of the glorious tropical climate, rest assured that there’s also an outdoor dining table and chair on the front terrace, where you can enjoy meals and good conversation as you take in the sea breeze. In the fully-equipped kitchen, you will find a wine cellar, microwave, double-door fridge, coffee maker and all the other utensils as well as equipment that you’ll need to prepare your meals. More impressively, the kitchen even boasts a barbecue that can cater to eight people at a time. 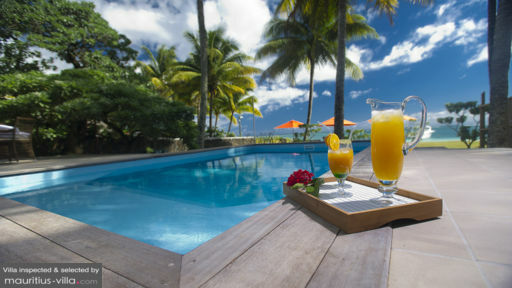 With a stay at Villa Belle Vue 3, you will be able to enjoy a plethora of services to ensure that your stay in Mauritius is as relaxing as possible. For instance, a housekeeper will come by every day to take care of the cleaning. Other services include an in-house chef, general maintenance, pool maintenance and a gardener. 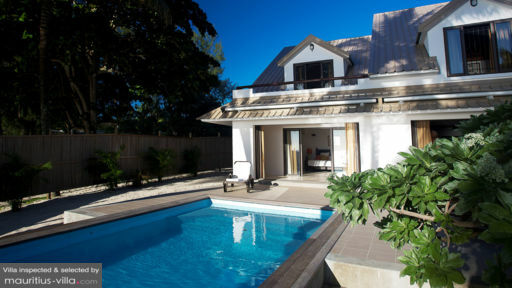 This villa is found a mere few minutes from Grand Baie, one of the most vibrant tourist spots in Mauritius. A short drive away is found the capital of Port-Louis, which is known for its colorful markets and delectable island street food.